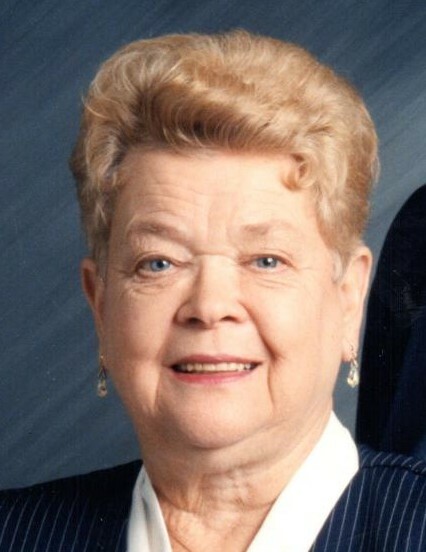 Obituary for Barbara Jean Melat | Hile-Best Funeral Home, Inc.
Barbara Jean Melat, 89, of Cranberry, died Friday evening, April 12, 2019 at her home, surrounded by her loving family. She was born in Van on December 13, 1929 to the late Fred H. and Lillian (Detar) Weaver. Barbara was a graduate of Rockland High School. She was a founding member of the Victory Heights Community League, as well as the Lo-Cal Gals weight club in Victory Heights and Tionesta. She was also a member of the Morris Chapter of the Order of the Eastern Star. Mrs. Melat was a longtime member of Van United Methodist Church; and also attended the Tionesta Church of God and Victory Heights United Brethren Church. She enjoyed playing the piano and the organ for church services. Barb enjoyed painting, camping, and spending time with her family, grandchildren, and great-grandchildren. She also enjoyed writing music and skits, and teaching piano lessons. Mrs. Melat worked as a floral designer at Phillips Flowers in Franklin. From 1962 through 1974, she and her husband owned and operated Melat's Grocery and Esso Station in Victory Heights. She was married in the Van United Methodist Church on April 28, 1948 to Robert E. Melat, and he preceded her in death on June 19, 2016. Surviving are five children: Dixie Peterson and her husband Jon of Victory Heights, DiAnne Slater of Seneca, Darcy Stover and her husband Terry of Cranberry, Jeffrey Melat and his wife Sue of Cranberry, and Jerald "Jerry" Melat and his wife Terri of Oil City; and 12 grandchildren, 25 great-grandchildren, and 4 great-great-grandchildren. Barb was anxiously awaiting the upcoming birth of her 26th great-grandchild. Also surviving is her brother, Harold Weaver of New York; and numerous nieces and nephews. In addition to her parents and husband, she was preceded in death by her sister, Avonell Meade; and a son-in-law, Alan "Butch" Slater. Friends and family will be received Wednesday (April 17th) from noon until 3 p.m. in the Hile-Best Funeral Home, 2781 Rte. 257 in Seneca, Cranberry Township, where a funeral service will follow Wednesday at 3 p.m. with Rev. Sam Wagner, associate pastor of Christ United Methodist Church in Franklin, officiating. Interment will follow in Melat Cemetery in Kennerdell. The Melat family would like to extend their thanks and appreciation to all of Barbara's caregivers for the excellent care and assistance that they have provided through the years. Memorial contributions may be made to the Venango V.N.A. Foundation (Hospice), 491 Allegheny Blvd., Franklin, PA 16323; or Seneca Volunteer Fire Dept., P.O. Box 272, Seneca, PA 16346.